Be the first to share your favorite memory, photo or story of Althea. This memorial page is dedicated for family, friends and future generations to celebrate the life of their loved one. Althea was born on the 29th of March 1937, the first child of Stephen David Fitch and Lila Althea Fitch (Wagner) at Emerson Hospital in the Jamaica Plain neighborhood of Boston. She spent her early childhood years at her family homes in Randolph and Mattapan, MA. In 1946 the family pulled up stakes and moved to make their new home in Dresden, Maine, when her dad took a career-long position with the State of Maine as a master electrician. Althea attended Dresden schools, was named Valedictorian of her eighth-grade class and graduated high school at Bridge Academy in 1954. During her school years, she was an avid and accomplished tap dancer and had the honor of performing for then Governor Clinton Claussen at a talent event in Augusta. In her off-school time, she did part-time work as a babysitter and as a store clerk at the W. T. Grant department store in Gardiner. After graduation, Althea made the decision to become a wife and homemaker, and she married Judson Cromwell (late) of Westport Island. They made their home on the island for many years, where they raised their three sons, Tom, Mike and Brian. In between bouts of being the mom of the house and trying to keep a lid on her three “adventurous” boys, Althea enjoyed the outdoors, walks to the shore of Montsweag Bay, fishing for stripers, enjoying the water, the quiet and the sunshine, and hanging out with the family dog “Lady”. When spring arrived each year, she loved looking for mayflowers, her mainstay assurance that summer was soon on the way. In the 1970’s and 1980’s, Althea spent many “memorable” days on the lobster boat with her husband, as “volunteer sternwoman”. She had some well-honed homemaking skills, she loved to cook for family and friends, and she was quite accomplished in knitting, sewing, crocheting, needlepoint and cross-stitch. Althea always enjoyed planting and tending her summer vegetable and flower gardens. In 1977, Althea became a certified EMT and served on the Wiscasset Ambulance Service for a number or years thereafter. In the 1970’s, she was a founding member of the nonprofit “Westport Island Willing Workers”, a community-oriented organization which promoted volunteerism, community service and youth recreation. For several years, she served the Town as the IFW licensing agent for hunting and fishing licenses. In 1990, Althea and partner “Chris” Roy opened and operated an antique letterpress operation on Westport Island, which employed vintage “Linotype” typesetting machines and hand-operated printing presses. In 2015, Althea became a founding member of the nonprofit “Westport Island Helping Hands” food pantry and community assistance organization. 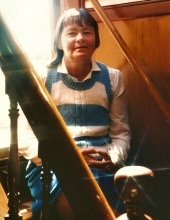 In the 1990’s, Althea had the honor of being a crew member of the F/V Sherman Zwicker, an early 1900’s Grand Banks fishing schooner of the Grand Banks Schooner Museum, as well as part-time caretaker of the Ram Island Light Station at the eastern entrance to Boothbay Harbor and Linekin Bay. Aboard the Zwicker she made some fond and enduring memories, with great camaraderie, of sails to Lunenburg, Nova Scotia and Sail Boston 1992. Summer days on Ram Island brought tranquility to her existence (thunderstorms aside). A debt of gratitude, acknowledgements and special thanks go out to Captain George H. McEvoy of the Grand Banks Schooner Museum, and the late Captain Frederick B. Guild, former master of the schooner Victory Chimes, for giving Althea some warm, special and memorable times onboard. Many thanks also go out to Mr. Ian Ramsey, band director, and the entire ensemble of Pan Fried Steel for the many happy times at the annual end-of-winter music celebration “Caribbean Night”, at the Opera House in Boothbay Harbor. Althea was always ready to get “In the Mood” when she heard the sweet, melodic pinging and ringing of those steel pans. Althea was predeceased by her parents, a brother David L. Fitch and his wife Hatsumi of Rome, NY, a brother-in-law Albert Mayo of Dresden, and her longtime friend and partner, Michael E. “Chris” Roy of Wiscasset and Westport Island. She is survived by sisters Jean Mayo of Dresden, Eleanor Fitch of Kingman, Arizona, Rebekah Applin and husband Dennis Jumper of Wiscasset, Mary Small and husband Ralph of Stockholm, and brother Joseph Fitch of Wiscasset, as well as her three sons Thomas A. Cromwell, Michael E. Cromwell, Brian E. Cromwell and wife Doreen, all of Westport Island, grandson Christopher Cromwell and his wife Elizabeth Quimby-Cromwell of Lisbon Falls, granddaughter Michelle Moon and her husband Ben Wolcott of Chesterville, granddaughter Xantha Morse-Widbiller of Wiscasset, grandson George Cromwell of Westport Island, great granddaughter Zoe Morse of Wiscasset, many nieces, nephews and special friends. In lieu of flowers, Althea requested that memorial contributions be made to Midcoast Humane, the Kennebec Valley Humane Society, the Dresden Historical Society, the Wiscasset Ambulance Service or the Westport Island Helping Hands Food Pantry. To send flowers or a remembrance gift to the family of Althea M. Cromwell, please visit our Tribute Store. "Email Address" would like to share the life celebration of Althea M. Cromwell. Click on the "link" to go to share a favorite memory or leave a condolence message for the family.